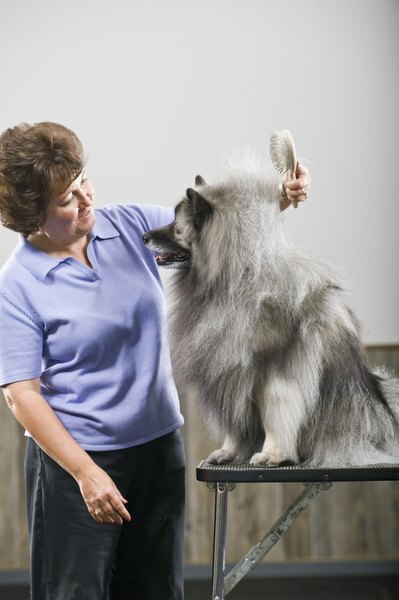 Daily grooming helps all dogs sport a beautiful coat, especially long-haired pups. Having a canine romping around your house makes your days more exciting, but it also makes them busier. Caring for your canine involves a handful of daily responsibilities, from making sure his food and water bowl are filled to emptying his energy reserves that otherwise can make him hyper. Food and water are two resources you need to offer your pup multiple times a day. Free-feeding -- where your pup has a big bowl of food available to him at all times -- allows you to feed him only once a day, but some dogs turn into gluttonous little piggies if they have unlimited food in front of them. You can better control your pup's weight if you follow the dog manufacturer's daily feeding guidelines, or guidelines set by your vet. You won't need to trim around your pup's eyes every day or bathe him every morning, but daily canine care includes brushing, spot cleaning and ideally teeth cleaning. Running a comb or brush through your pup's coat each day keeps his fur healthy and shiny and cuts down on the amount of hair that falls off of him and collects on everything you own. Spot cleaning involves wiping down muddy paws, legs and bellies, and removing whatever hitches a ride on your pup from outside, such as burrs and thorns. Brushing your dog's teeth helps keep them clean and him free of major dental problems, such as periodontal disease, and only takes a few minutes. Your four-legged friend needs lots of exercise to keep his energy reserves low and stop him from acting out. Playing fetch a few times a day, engaging in a couple games of tug and going for a long walk keeps him from becoming bored and frustrated. Taking him somewhere he can run free, such as a dog park, or involving him in exercise-intense activity, such as dog agility or backpacking, is even better. Note that some dogs require more exercise than others. A bulldog, for example, does not need and should not engage in highly strenuous exercise, while a German shepherd greatly benefits from all the tiresome activities. DogTime.com suggests canines get 30 to 60 minutes of exercise every day. Daily obedience training helps pups who already have mastered several commands and dogs who have yet to learn one. Obedience isn't like potty training. After your pup learns that the grass is where he needs to relieve himself, he stops eliminating inside. In contrast, suppose you teach your pup to sit, lie and stay. If you don't practice the commands regularly, he likely won't obey them consistently. Don't mistake daily training for organized training sessions. Organized sessions are helpful for teaching your pup something new, but daily training consists of reinforcing obedience throughout the day. For instance, if he wants a piece of cheese, he needs to lie down. When you take him for a walk, he needs to sit before you walk out the door. Unlike cats who have a litter box to walk into, dogs require the great outdoors to relieve themselves. If you have a fenced-in backyard, you only may need to open the door to let your pal out. If your yard isn't enclosed, you will be getting fresh air several times a day. The American Society for the Prevention of Cruelty to Animals suggests allowing adult dogs outside to use the bathroom a minimum of four times per day. Puppies require more frequent bathroom trips. Can You Stop a Dog From Howling in His Sleep? What Can You Feed a Dog to Firm Up His Stool? How Long Do Flat-Coated Retrievers Live? Why Are Dogs Always Burying Things?